With the enticing toy of the toilet paper hanging on the wall, it can be difficult to discourage your cat from playing in the bathroom when you're not at home. Use these handy tips to set a few minor booby traps and keep your bathroom feline-free. My friends with cats often complain to me that their cats are always getting into the bathroom toilet paper roll and other behaviors that ought to be off limits. So today, I am going to help you with a few tips on how to help train kitty not to go after your toilet paper. Get a small paper cup, like a Dixie cup, and fill it halfway up with cool water. Now, place it carefully on top of your toilet paper roll. Be sure you use an inexpensive brand that you will not mind getting wet a few times just until your kitty learns not to touch the roll. Trust me, she will learn this quickly. When your cat attempts to play with the toilet paper, wow, what a big surprise she is going to have when the Dixie cup of water falls on her. Cats normally do not like getting hit with water as a surprise. Most don't even like playing with water unless maybe there is a fish in it they want to catch. Another favorite deterrent you can used to keep your cat from unraveling the bathroom roll is the old fashioned "penny can". This homemade tool is sometimes used to train dogs, but it can also be used in a pinch to train your cat as well because most cats do not like to be startled by the unexpected rattle. Get an empty can like a Pringles mini can, and then add about 30 pennies to it. Put the lid back on and wrap a little duct tape around it to secure it. This will keep the lid from coming off when the can is knocked over, and will prevent your pet from ingesting the coins since they can be toxic. Next, balance the can evenly on top of the paper roll or any bathroom item you no longer want kitty to play with. When your cat begins pawing where she shouldn't, the penny can will crash down creating enough noise to startle your cat away. Just like the water cup, the penny can reinforces the idea that the bathroom is no place for kitty to play. Aluminum foil is another item cats do not like too much. You can roll up a few aluminum balls and place them on the lid to the commode, the tub ledge, toilet paper roll or anything else you want your cat to leave alone. You can also try covering the entire roll of toilet paper with the aluminum foil. This way your cat cannot get to it at all and should eventually quit looking for it altogether. The previous tips are probably the most effective, but it you really don't feel like booby-trapping your bathroom, you can try hanging the toilet paper roll backward. 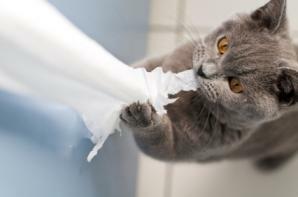 Cats generally have to reach up and claw downward to get the roll to unravel. By hanging it backwards, it just keeps rolling around as kitty swipes without releasing anymore tissue to play with.